Congresswoman Eleanor Holmes Norton arrived and spoke about the work she and her office do to support the District. Eleanor Holmes Norton speaks at the ANC meeting. She said she’s given an hour to talk about statehood on the floor to help new Representatives learn about the issue. Similarly, there’s a bill on the floor to make Puerto Rico a state — (they don’t pay federal income state taxes!). A Republican delegate from Puerto Rico put up the bill, but he won’t sign on to DC’s bill for statehood. 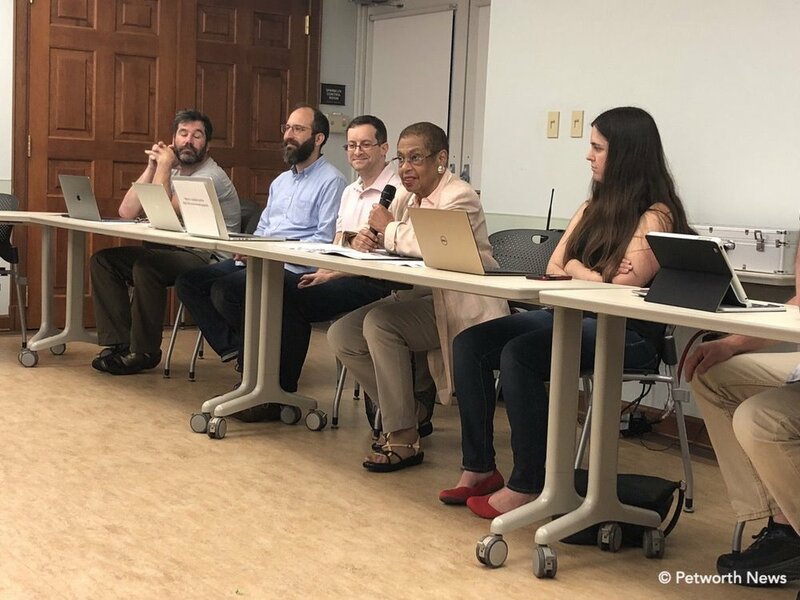 For example, regarding the decriminalization of marijuana in the District, Norton said that while DC voted to legalize two ounces, eight other states have legalized marijuana, and DC wants to do what other jurisdictions have done and commercialize it. However, there’s a rider on DC’s budget appropriation that disallows that. Additionally, local (DC) funds are not allowed for abortion for low-income women. Another example is the Death with Dignity Act; DC passed a bill to allow people with less than 6 months to live to get pharmaceuticals to allow them to end their lives. “That’s their personal decision,” Norton said. However, it’s disallowed by Congress. She also stated that she wants ICE to brief her on immigration arrests and child separations occurring in the District. She said ICE won’t brief her, so she’s trying to bring it up in committee. Commissioner Jonah Goodman asked for ways to get more information from DOJ on court cases (all DC cases go to federal court). Josh Fleitman from Councilmember Brandon Todd’s office spoke about recent activity in the DC Council. Regarding the AirBNB vote, he said Todd wants to expand the 90-day limit, and add a +1 amendment so people can rent out a second home. The Council also held a hearing on the Clean Energy bill, which would DC using 100% clean energy by 2032. DC has also established an office of Night Life and Culture, (originally proposed by Todd). The office will coordinate public safety and other business issues that go along with DC’s burgeoning night life industry. Regarding AirBnBs, Commission Mike Halpern said he’s spoken with residents about the short-term rentals. “What I’ve heard is that having people coming in every few days, it creates challenges for people to know each other, if there are events, et cetera. Impacts quality of life.” One house in his SMD has had that problem, he said. He also commented that large potholes on Spring Road are still not fixed. Commissioner Timothy Jones asked for update on street light repair. Fleitman said there were issues with the Request for Proposal for the streetlight initiative, they’re narrowing down a core list of companies. Kelly Hunter, Ward 4 liaison from MOCR, said that as of October 21st, feminine products are now tax exempt. Julian Hipkins, from Roosevelt High School, spoke about the new interim principal, Justin Roustin. He said the school hosted Spanish students from Madrid, and now have 23 French students coming. Hend Elhendy, a visiting Arabic teacher at Roosevelt, said she is teaching critical language programs at the school on an exchange program which gives American students the chance to study Arabic. She said it helps students become global students and be familiar with other languages. A resident spoke about repaving issues at top of Upshur — “no parking” signs went up with no information on what it’s for, but the work didn’t happen, yet the signs are still up. Wants to know how to get answers from DDOT? Commissioner Karen Cooper suggested that calling 311 was the best way. Juanita McKenzie, who runs the Randolph Street Tenant Association and advocates for affordable housing, said she recently received an award from office of Tenant Advocacy. She thanked the ANC, and said she was able to get $8.4 million to renovate their buildings on Randolph. Commissioner Zach Teutsch mentioned the DDOT NOI for changes at the intersection at Spring, 13th and Kansas Avenue. Next up, Zoning issues (BZA Board of Zoning Adjustment). At 4222 8th Street NW, they want to raise the rear mansard roof to get adequate headroom in the back of the house. Said they’re doing all the construction “as a matter of right” (side note, I love it when developers proactively defend themselves with saying “a matter of right” as a preface to how they’re going to rip apart a single-family home). The developer doesn’t want to carry the mansard roof around to the back (it currently does). ANC voted to support the exemption. For the contentious development of 716 Upshur Street NW (turning a single family home into an extremely large three unit condo). The architect and developer spoke at the ANC in August and September. The ANC did not support the project at that time, and subsequently the BZA requested changes last month, along with a shadow study, and want the developer to look at design alternatives to diminish the appearance from the rear and not infringe the privacy of the neighbors. Next meeting is October 31st with BZA. There’s three options for the development, and the developer said they are pursuing the second option. 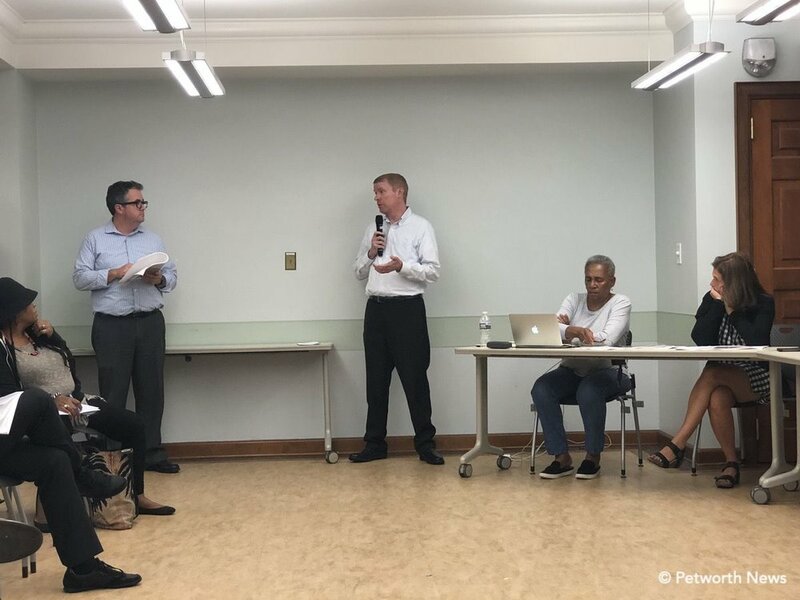 In light of the shadow studies, Commissioner Timothy Jones proposed a resolution to oppose the developer’s request and instead have them to build a two-unit condo. The vote on the resolution failed with three yes, three no, two abstain. I voted against opposing the project, not to support anything the applicant was requesting, but to say that I did not support a flat-out rejection without any attempt at negotiations. My expectation for BZA cases we hear is that the Commissioner will attempt to start a dialogue with neighbors and the developer. When this case came to us last month that had not happened. Several neighbors wrote to the Commission asking for help to have the applicant modify their plans to address concerns. We negotiated for four off-street parking spots after hearing that one of the biggest concerns with the density was street parking. We negotiated a financial contribution to the Affordable Housing Trust Fund to build affordable housing. We also had asked for testing for lead in the water lines and replacing them if positive and for permeable pavers to mitigate rain run-off issues. When these concessions came up for a vote the Commission voted to oppose the project and we lost all of them. When this was sent back to us to review the second time from the Board of Zoning Adjustment there again were no community meetings that I am aware of. The applicant reached out to Commissioners asking to meet with us to hear what we wanted. 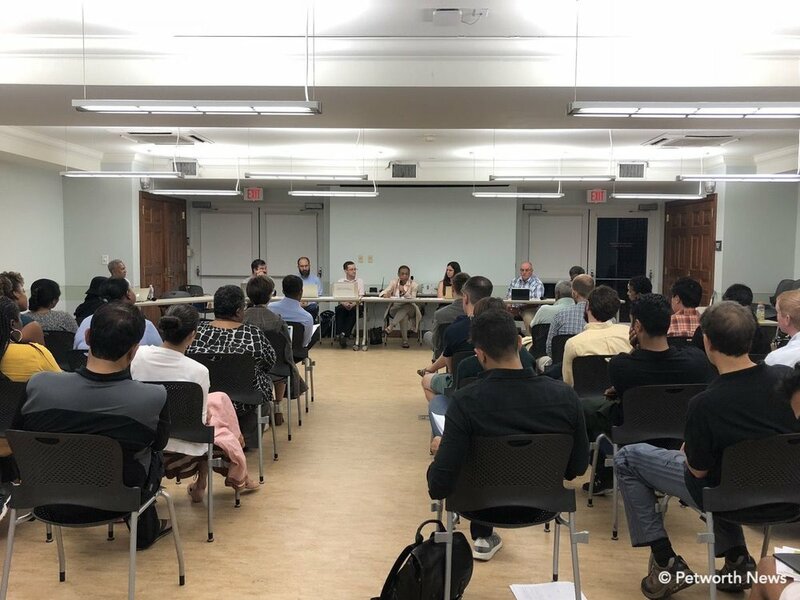 The applicant is almost certainly looking to maximize their profit but they have expressed a continual interest to modify their plans to gain support from the community. We have no idea what they would have been willing to do because we refused to even ask. At 845 Upshur Street NW, the new owner of the building, Marc Dosik, came to ANC to present his plans to renovate the old China American Inn. The architect spoke about increasing the building to 3 stories, putting retail at the bottom, and apartments on the top two floors (likely a restaurant on the bottom floor). The apartments will be 4 units (2 on each floor). Project is “by-right” except for lot occupancy (how much land is occupied by the building). Lot occupancy is 60%, because residential is going in, can’t go more than 60% (they could if they only put in businesses). “Three stories is in harmony with Upshur Street, and the new design matches the adjacent property,” said the architect. Note the adjacent property is also owned by Dosik — having both buildings match in style and size will definitely look better, and offers more retail and living space on the busy block. Park Place, where the new burger restaurant will go. On 1322 Randolph Street NW, the ANC passed a motion to support a Neighbor Underpinning Agreement. The developer worked with the neighbors to resolve issues and is donating to Affordable Housing Trust Fund. The new restaurant, Catch 22 (5832 Georgia Ave NW) is taking over the IM Thai location (this location has never done well for restaurants, it’s a condo up top — fun fact, used to be a Masonic temple). Owners of Milk & Honey cafe, southern seafood cafe, are opening up in the location. Will offer salmon, crab, catfish, shrimp, grits, tilapia and more in a chef-driven concept. No live music. Focus on the food and guest experience. Owner lives at 5th & Upshur. The Dollar Plus at 4418 Georgia Avenue NW wants to be able to sell beer at their location. Working on a Settlement Agreement with the ANC. Commissioner Goodman introduced an amendment to the ANC’s bylaws (see page 11-12 of this doc).